Cyclic Design specializes in error correction (ECC) IP for NAND flash memory interfaces. The tight integration of NAND flash support with other I/O logic can make supporting later generations of flash memory more difficult due to increasing ECC requirements. Cyclic Design provides an easy-to-integrate ECC solution, allowing customers to retain their existing design infrastucture and software solution. 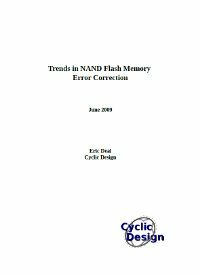 As NAND flash scales to smaller geometries, the error correction requirements increase for both SLC and MLC devices, requiring changes to existing controllers. Cyclic Design can provide the error correction expertise at a fraction of the cost of in-house development, allowing you to focus on your application. 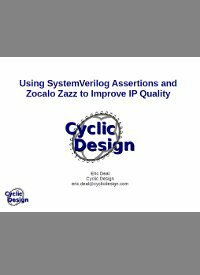 Why work with Cyclic Design? Founded by an experienced hardware designer and architect, Cyclic Design understands not only NAND flash controller architecture but also the complexities of integrating IP into chip design. 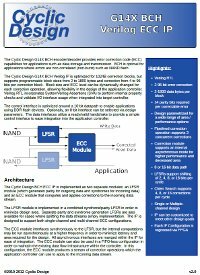 While the off-the-shelf designs are designed for modularity and easy integration, Cyclic Design can also tailor the IP to meet your application's specific needs. 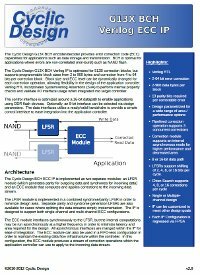 NAND ECC - How Many Parity Bytes?